A framework for the automated derivation of finite difference solvers from high-level problem descriptions. OpenSBLI is a Python-based modelling framework that is capable of expanding a set of differential equations written in Einstein notation, and automatically generating C code that performs the finite difference approximation to obtain a solution. This C code is then targetted with the OPS library towards specific hardware backends, such as MPI/OpenMP for execution on CPUs, and CUDA/OpenCL for execution on GPUs. 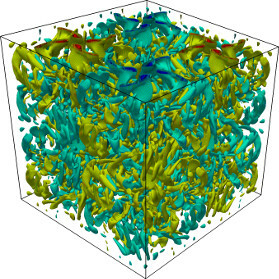 The main focus of OpenSBLI is on the solution of the compressible Navier-Stokes equations with application to shock-boundary layer interactions (SBLI). However, in principle, any set of equations that can be written in Einstein notation may be solved.